After a recent viewing of Star Trek: Into Darkness, my friend jash and I felt the need to wildly decompress from two hours of explosions, Spock bangs, and futuristic 9/11 imagery. And so we too stepped into darkness by taking in dinner at the dimly lit Stella Barra on Sunset Boulevard. Attached to the ArcLight and cousin to Stella Rosa in Santa Monica, the new restaurant has a reputation for awesome pizza and killer cookies. Naturally, this was right up my (Kirstie) alley. That was a bonus Star Trek reference, in case you were wondering. jash and I kept the order simple. He ordered a glass of wine and a spinach and kale salad with pecorino ramona, Medjool dates, shaved radishes, and mustard vinaigrette. I too wanted to be healthy, but resistance was futile. 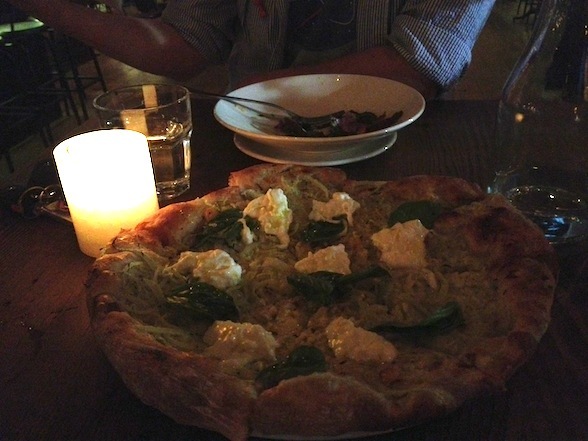 I wound up requesting a fennel bianco pizza, which featured fennel, burrata, rosemary, torn basil, and olive oil. The friendly waiter then informed us that the policy of the restaurant is that when something is ready, it’s ready, and the food will arrive as such. It seemed like a strange approach, but I figured it wouldn’t be a big deal — that is, until jash’s salad arrived five minutes later (sans wine), and we had to wait an additional fifteen or twenty for my pizza. Yes, we were warned of the policy, but that doesn’t mean I have to like it. As for that salad, it was very tasty, but teeny tiny. We’re talking side-salad size. At $10, it veers into “overpriced” territory. More appropriately priced was my pizza ($15), which was strong flavor-wise, but was so soggy and oily in the middle that the slices were near impossible to hold. Still, structural issues aside, I enjoyed the burrata and fennel, and found I was able to crisp up the slices a bit more the next day when I flung the leftovers in a skillet and heated them up for five minutes. Eventually, the waiter discovered that he had neglected to bring jash’s wine, and to apologize, he gave us a free chocolate chip Rice Krispie treat cookie that may as well have descended directly from heaven. This cookie was far and away the best part of dinner, and I would truly consider going back to Stella Barra for the cookie alone. This entry was posted in Dining, Food, Restaurants and tagged jash, pizza, restaurants by Ben Mandelker. Bookmark the permalink. That cookie is amazing! Grabbed one a week ago! I loved that place but thought the salads were kind of pointless. Cookies, straight from heaven. Love the Kirstie Alley reference!